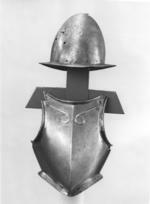 The breastplate is deep waisted with a medial ridge, one waist lame and a restored fauld lame. There are gussets at the arms. The main edges have roped inward turns bordered at the neck with a recessed border and adorsed volutes. The subsidiary edges are scalloped. At either shoulder is a rivet, also securing the gusset, for the shoulder straps. The restored fauld lame is deep, with a central arch, and four rivets where tassets were attached. It is screwed to its mount. The morion is of one piece with a pear stalk at the top and a flat brim extended to a point at front and rear. The main edges have file-roped inward turns and narrow recessed borders. Around the base of the skull are eighteen holes for lining rivets. There are numerous holes at the front of the skull, and suspension holes at either side, front and rear.